To change handicap calculation modes, click Setup menu and select Calculation Options. HS provides three calculation modes: USGA, RCGA and CUSTOM. Drop the list box and select the appropriate mode. USGA mode calculates an exact United States Golf Association handicap. RCGA mode calculates an exact Royal Canadian Golf Association handicap. Note: RCGA now refers to the "index" as "factor". If you are using the RCGA mode, "factor" will replace the word "index". CUSTOM mode lets you set up your own handicap parameters. Note: You can switch between USGA, RCGA, and CUSTOM calculation modes at any time. Switching handicap modes has no effect on scoring information, HS simply recalculates new handicaps based on the new setting. You can change the ceiling for indexes. 36.4 for men and 40.4 for women (18.2 / 20.2 for nine holes) is the recommended ceiling, however you can relax the Index ceiling if desired. Any 18 hole handicap that exceeds the standard USGA \ RGCA limit is identified in HS with a "L" (to indicate a Local handicap). Any 9 hole handicap that exceeds the standard USGA \ RGCA limit is identified in HS with a "J" (to indicate a 9 hole local handicap). A Handicap Index computed above the limit can only be used for intra-club play. HS also contains a table which displays the number of differentials used according to the number of scores available. For example, if a golfer has 9 scores to look at, only the lowest 3 differentials will be used to calculate a handicap. This table follows USGA\RCGA rules and cannot be changed. Click the "Stroke Control" tab to see how Equitable Stroke Control (ESC) is calculated\figured. This table follows USGA\RCGA rules and cannot be changed. How are USGA \ RCGA handicap indexes calculated? The first step is to enter only a golfer's adjusted gross scores (not gross scores). To adjust an original gross score you use the Equitable Stroke Control (ESC). ESC is used to downwardly adjust individual hole scores for handicapping purposes in order to create handicaps that better represent a golfer's playing ability. ESC prescribes a maximum number of strokes that can be entered for any hole. This maximum is based on the golfer's Course Handicap and is obtained from the table shown below. Note: You must enter scores hole by hole (use score card) for the software to automatically calculate an adjusted gross score. If your adjusted gross score is more than the Course Rating for the course on which the round was played, the Handicap Differential will be a positive number. If your adjusted gross score is lower than the Course Rating, the Handicap Differential will be negative. The third step in calculating your Handicap Index is to select the lowest Handicap Differentials. The following table is used when selecting the best, or lowest, Handicap Differentials. If more than 20 scores have been entered, the 10 best differentials of the 20 most recent scores are used for the calculation. * The USGA \ RCGA does not calculate a handicap until five scores have been recorded. The fourth step in computing the Handicap Index is to calculate the average of the selected lowest Handicap Differentials. Simply add the selected Handicap Differentials together and divide by the number of selected Handicap Differentials. The fifth step in calculating the Handicap Index is to compute the net Handicap Differential average. For the USGA, and RCGA System the percentage by which the Handicap Differential averages are multiplied is 96%. Step six in computing the Handicap Index, is to delete the digits after the tenths place of the net Handicap Differential average. Do NOT round off to the nearest tenths place. As established by the USGA, the default maximum Handicap Index on an 18-hole course is 36.4 for males and 40.4 for females. On a nine-hole course the default maximum Handicap Index is 18.2 for males and 20.2 for females. The maximum ceiling can be increased. 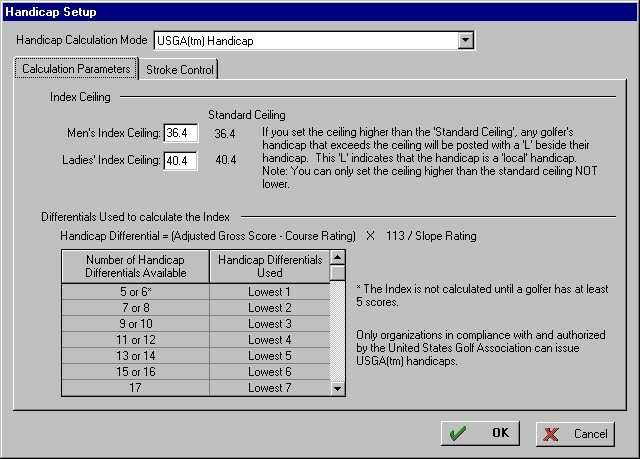 The following is an example of how the Handicap Index is calculated using the USGA System. This example assumes only 14 scores have been posted for this golfer. The final step is to calculate a Course Handicap. A Course Handicap is the number of strokes a player receives on each particular course. The computer determines a course handicap by multiplying the Handicap Index by the Slope Rating (from the course and tee you choose) and dividing by 113 (the base slope) then rounding to the nearest whole number. The following assumes an index of 12.5 and a Home course slope of 120. The Handicap System can calculate indexes and handicaps using the exact USGA (United States Golf Association) calculation formulas and nomenclature. This also includes the "Reduction of Handicap Index for Exceptional Tournament Performance". If a player consistently scores better in tournaments, his\her handicap is subject to adjustment by the "USGA Handicap Index for Exceptional Tournament Performance". Note: If your organization does not qualify to issue USGA handicaps, you can still use the Handicap System to issue a custom handicap which emulates the USGA. This would not be an official USGA handicap, but would be very close. A "golf club" is an organization of at least ten individual members, that operates under bylaws with a Handicap Committee to supervise golf activities, provide peer review, and maintain the integrity of the USGA Handicap System. Members of a golf club must have a reasonable and regular opportunity to play golf with each other. They must be able to return scores personally, and these scores must be available for review by fellow club members. Note: For administrative reasons, some golf associations may require a golf club to have more than the USGA minimum of ten members in order for that club to be a member of the golf association. Q: A group of 52 employees of our company formed a golf club. The members work at the same office and play in a weekly league after work. We have by-laws based on the USGA's sample "By-Laws for a Club Without Real Estate" with officers and meetings. A Handicap Committee has been formed and Handicap Reports are posted on a bulletin board for all to see. Scores are personally posted by the members and reviewed by the Handicap Committee. All other requirements of the USGA Handicap System are followed. Is this group a "golf club" for purposes of the USGA Handicap System so that it can issue Handicap Indexes to its members? A: Yes. Peer Review standards are being met as members have a reasonable and regular opportunity to play golf with each other, as well as review scores posted and the Handicap Committee has the reasonable opportunity to provide its necessary peer review oversight requirements set forth in Section 8. 2. Clarification of Term "Golf Club"
Q: Membership in a golf organization is open to any player living within a large geographic area. In general, the members play at different golf facilities within the area, and do not normally play golf with one another. Only a small percentage of the members ever compete together. Is this organization a "golf club" within the meaning of the term in Section 2? A: No. Section 2 states that in order for an organization to be considered a golf club, "members must have a reasonable and regular opportunity to play golf with each other." Q: May a driving range sell memberships to its customers in order to issue USGA Handicap Indexes? A: No. Hitting balls at the same driving range does not provide the opportunity to play golf together as required in the definition of a golf club. Q: An organization places an advertisement in a public newspaper inviting golfers to join a group that it calls a "golf club." The golfer is asked to sign-up by mail and mail in a check to a central office where a "Handicap Committee" resides. In return, he will receive a Handicap Index. Members are invited to play in tournaments held frequently and handicap reports are mailed to each member on revision dates. Members generally mail-in scores to the office organization. Can this organization meet the USGA Handicap System definition of a "golf club" and can it issue golfers Handicap Indexes? A: No. A strong sense of a cohesion and organization must exist amongst the members of a group or else the essential element of peer review is absent. Because of the advertising in a public newspaper, most members of this organization would join as strangers, live over a relatively large geographic area and have insufficient opportunity to play golf regularly with one another. Furthermore, a Handicap Committee must be in a position to implement its peer review responsibilities. The organization described cannot provide the Handicap Committee with effective local oversight of its membership. The ability to play in group tournaments does not provide the peer review required by the USGA Handicap System for either the players or the Handicap Committee. Further, another independent reason why this group does not function as a golf club is that most scores are mailed in, which severely limits peer review by players and the Handicap Committee; this is not within the spirit of Section 5-2a and Section 8. Finally, another reason that peer review requirements are not being met is that this organization does not post scores and reports at a common location to be seen by the membership.